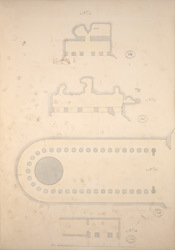 Pen-and-ink and wash drawing of the ground plans of Cave 3, 5, 10 and 18 at Ajanta, from an album of 26 ground plans of the Ajanta caves and 16 folios of drawings of sculpture and architectural details in the Ajanta caves. c.1850. The magnificent cave temples of Ajanta are situated in a horse-shoe valley of the Waghora river in West India and consist of prayer halls (chaityas) and monasteries (viharas), built for the Buddhist community who lived there. The first group was excavated between the second - first centuries BC; then, after a period of more than six centuries, the excavations restarted around the fifth century AD, in the Vakataka period. Cave 5 is a small unfinished vihara ascribed to the seventh century AD. On the right of the verandah there is a cell. The only standing pillar of the verandah has a square base, an octagonal shaft and a round capital. The door-frame is decorated with carvings and figures of divinities standing on makaras. Cave 10 is the oldest of the Ajanta caves and was excavated in the second century BC. It is a Buddhist chaitya hall with an apsidal-ended interior divided in three aisles by plain octagonal columns. At the end of the central aisle there is the votive stupa. Cave 18 is a small cave that serves as a passage leading to Cave 19. It has two octagonal pillars.